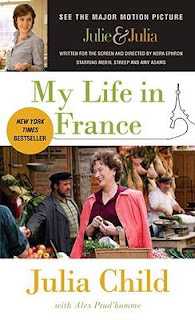 The Kitchen Reader book for October is My Life in France by Julia Child with Alex Prud'homme. Alex worked with Julia in the last year of her life to put together this book from her memories and from old letters that the Childs and their friends and relatives had sent over the years. The idea for the book had first been floated by Paul Child, Julia's husband, in 1969, but it was not until shortly before Julia's death in 2004 that the idea came to fruition. It was a close call, as Alex had to finish the book after Julia's death. My Life in France documents the lives of Paul and Julia Childs, not only during their time in France, but also during Paul's diplomatic transfers to Norway and back to America before his retirement. Through its pages, we learn how Paul and Julia came to be in France, and how Julia came, first to cooking and earning a diploma from Le Cordon Bleu, then to writing Mastering the Art of French Cooking (MtAoFC) and her subsequent TV career. I learned for the first time that Julia co-authored MtAoFC with two French women, Simone Beck (known as Simca) and Louisette Bertholle, and that the project to write a book on French cookery for American women was actually started by Simone and Louisette. It was not until their original publisher rejected their efforts and suggested that they find an American collaborator to help them that Julia's involvement with MtAoFC commenced. None of Julia's achievements came without considerable downs and lots of hard work. Perhaps the most striking aspects of Julia's personality which shine through in My Life in France are Julia's determination and committed work ethos. Without them, MtAoFC would never have been published. The pages of My Life in France are littered with colourful characters, including the larger than life Julia and her sister, Dort, through to their cantankerous father, John McWilliams, the Childs' French maids, Coo-Coo and Jeanne-la-folle ("crazy Jeanne"), Chef Bugnard, Julia's teacher at Le Cordon Bleu, Julia's devoted friend Avis De Voto (who is integral in MtAoFC finally being published), Judith Jones, the editor who made MtAoFC happen, and last but certainly not least, Paul Child, the love of Julia's life. The relationship between Paul and Julia is remarkable, and I would consider myself extremely blessed if I find a soulmate who makes me feel like Paul made Julia feel. Paul and Julia dubbed their apartment in Paris "Roo de Loo" (as it was located at 81 Rue de l'Universite), and it is here that much of the action in the book takes place. Although Paul and Julia are forced to leave Paris after 4 years for Marseilles due to Paul's work commitments, their hearts remain in Paris. While in Paris, Julia met Simca and Louisette, and together they started a cooking school called L'Ecole des Trois Gourmandes ("The School of the Three Hearty Eaters") before their book collaboration began. When Julia collaborated with Simca and Louisette on what was to become MtAoFC, there were so many hurdles to the book's publication that I am sure that Julia often had reason to recall one of Paul's favourite phrases, Illegitemus non carborundum est ("Don't let the bastards grind you down"). Julia's successful TV career began in 1962 after she returned to the US as a means of promoting MtAoFC, at a time when she had never even watched television. It was a baptism of fire, as the original three shows were filmed without interruption, and as Julia herself said, she was a complete amateur. However, those first three shows were popular enough for her show, The French Chef, to become a regular television program. Child residences which feature prominently with Roo de Loo include their Provence getaway situated near the Becks called La Pitchoune (meaning "The Little Thing" and dubbed "La Peetch" for short), and their final home at 103 Irving Street, Cambridge, Massachusetts, which Avis spotted for them, and from whence Julia's famous kitchen was relocated to the Smithsonian Institute. The book's conclusion is rather poignant, as Julia's relatives and friends begin "to slip off into the wide blue yonder". However, a life as rich as Julia's gives reason to celebrate rather than to mourn. We are incredibly lucky that, thanks to Paul Child's original idea, Julia's dedication to that idea and Alex Prud'homme's ability to bring it to fruition, we are able to share some of the details of Julia's life, and be inspired ourselves. My Life in France has a wonderful tale to tell, which is interesting and inspiring regardless of whether or not you have an interest in food or have seen Julia's shows or own MtAoFC. It gives readers an inside look at an extraordinary life and at a number of pivotal historical eras in modern European and American history. Silver Moon Dragon of Dragon Musings is hosting a Virtual Night In for Pink October, which promotes breast cancer awareness. The deadline for entries was last night - I somehow thought it was 31 October, so this post is late, but I figure it is still 27 October elsewhere in the world. You can donate to this worthy cause by sponsoring Silver Moon Dragon's blog party here. For my contribution, I have brought rose flavoured biscuits in the shape of pink girly shoes and dresses along. The biscuits are flavoured with crushed dried rose petals, and they are iced with pink icing flavoured with rose water. The recipe that I used is the same one that I used for the baby shower biscuits, but with the lavender substituted with rose. You have until midnight on 27 October to contribute your entry, or you can help out by making a donation to this worthy cause. 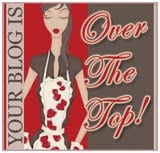 A roundup of all blog party entries will be published at Dragon Musings later in the week. Are your teeth aching after yesterday's Daring Bakers and TWD posts? Feeling the need for some powerful antacids? That's OK, this post tones it all down and goes back to a much less sweet, much more weight-friendly recipe in the form of a Pumpkin Apple Spice Bread, courtesy of Jill at Strawberry Spice. Because it is autumn in the Northern Hemisphere, and with pumpkin-friendly Halloween and Thanksgiving coming up, there are loads of amazing pumpkin recipes popping up all over the blogosphere at the moment. As a child, I loathed pumpkin, and I only tried it again because I lived at a University residential college for 5 years, where it was eat your veges or starve! Pumpkin was one of the only pleasant surprises that we were served, and I am now a confirmed pumpkin fan. This pumpkin apple spice bread (a cake, really) is not only delicious, but it is low in fat. It is also very forgiving, because in my absent-mindedness, I only added two egg whites instead of four, and it held together just fine. To make this wonderful cake, you can find the recipe here. Apart from the accidental reduction in egg whites, my other tinkering consisted of using some stewed apple I had in the freezer instead of fresh apple, and replacing the raisins with currants and the pecans with cashews, for no other reason than that is what I had lying around. This cake is delicious both warm and at room temperature. What else can I say - if you like pumpkin, make this cake! This week's Tuesday with Dorie challenge is a rich, decadent, Cherry Fudge Brownie Torte, chosen by April of Short + Rose. You can easily guess what this dessert cake is all about from its title; however, I will confirm that it consists of a rich, dense, chocolatey (>300g worth!) base dotted with dried cherries soaked in cherry booze and made sticky with (in my case) raspberry jam, then topped with a contrasting mousse of marscapone, cream cheese and cream. Oh, and in case you can't work it out (according to this article, the Australian public needs to be told such things), it is highly calorific. This torte tastes as devine as only that many calories can; however, you really only need a tiny slice of this to be satisfied, so when you spread the calories over the number of pieces of cake (I sliced at least 20 slices), it is not going to hurt once in a while as your treat of the day. And it does taste good - I could easily settle for the brownie layer less the cherry concoction and the mousse. It's not up there with my favourite desserts, but it is good. I also had a hard time finding the dried cherries. I remember that not so long ago I could buy them in the supermarket in Melbourne. Whether it's the change in geography which means that dried cherries just don't sell, or whether you never could buy them in Brisbane supermarkets, I could not find dried cherries in any of the 4 supermarkets that I canvassed. They weren't at the Powerhouse farmers market or New Farm Deli either (well, not without a chocolate coating). I found the Rolls Royce American version at Black Pearl for $17 per 200g (ouch! ), before striking gold at The Nut Market at James Street Markets (at $5.95 per 100g, still not cheap, but affordable). Mine puffed up and cracked slightly on top during baking, but settled down on cooling. Marscapone is sold in supermarkets in 250g tubs, so I scaled down the mousse recipe in proportion to 1 tub of marscapone, and this provided a nice, thick topping. If you would like to check out how the other TWD bakers went with this torte check out the Tuesdays with Dorie blogroll. For the recipe, check out Dorie's book or refer to April's blog (when it is Tuesday in the Northern Hemisphere). My macarons are peach flavoured and filled with raspberry ganache. The nacarons behaved quite well, and had domes and feet, so I was pleased with them, even if they were not as aesthetically perfect as the macarons I made in July with a different recipe. I had the benefit of reading the DB forums for the first half of the month before making these, and to flavour my macarons, I used peach tea, as suggested by Audax. The tea gave the macarons a pronounced peach flavour, and made flecks through the surface of the macaron for appearance and texture. However, even after 4 drops of liquid orange colouring, my macarons are not very peach-coloured - oh well. It was the ganache, not the macarons themselves, which let me down. I tried a recipe for the ganache that says to add a third of a cup of raspberry jam to the cream and white chocolate for flavour. That is where disaster set in, and I ended up with a sticky, runny mess that never set up. However, chocolate is an expensive commodity, and I wasn't prepared to pour it into the bin and start again when really the point of the exercise for me was the macaron base, not the filling. Despite the runny, hopeless filling, these macarons tasted delicious, and it hasn't put me off making macarons again should I have a yen to do so. However, it was nonetheless disappointing that the filling spoiled the appearance of the macarons. You can see a rainbow display of macarons of all varieties by going to The Daring Bakers blogroll. And for some cute as a button but no cal macarons, see Sian Keagan's wool macarons at Lushlee. Happy Friday everyone! It's a good one for me because for the first weekend in ages, I don't have anywhere that I have to be or anything that I have to do. I am looking forward to spending my time tracking down some TWD ingredients which are exotic for Brisbane and to going to a Craft Fair to hopefully pick up some craft bargains (for all that craft that I do in my non-existent spare time, he, he). To mix things up a bit, I am going to share a couple of main meals that I made recently - my true love is baked goods, but I enjoy cooking a good meal as well. At the top of this post, I have featured in its uncooked state a leg of lamb that has been marinaded in accordance with Clotilde's recipe for Slow Roasted Shoulder of Lamb rubbed with Rosemary, Anchovy and Lemon Zest. Lamb shoulder is not within the province of my supermarket, so I made do with a leg of lamb. The little seeds you can see are mustard seeds, which I had a hard time buying - I went to three supermarkets before I found some. I made this lamb when I had some friends over for dinner a little while ago. I have to tell you, this lamb tastes magnificent!!! My lamb marinated for a couple of days, and the flavour in the finished product (which I neglected to photograph) was devine. I served it with beans and jewelled couscous, and it was a hit. I don't like my lamb pink inside (it's an Australian thing), so I pumped up the heat for the last hour or so to ensure that the meat was lightly browned all the way through. Some of you may shudder at this, but I can assure you that it did not take away from the flavour in any way, and my guests seemed appreciative. The next meal that I will share with you is Chicken and Borlotti Bean Stew. The recipe came under a slightly different name from p140 of the November edition of Australian Good Food. Now I know that you don't want me to bang on about calories, fat etc, as this is after all primarily a baking blog, but this meal is low in both, but still tastes good. The only change that I would have made is to season it with salt and pepper (the recipe is trying to be uber-healthy and doesn't talk about seasoning), but it is both hearty and delicious - a keeper for me. Heat the oil in a wok or deep fry pan, then brown the chicken in batches and set aside. Cook the onion in the same pan until soft and translucent, then add the garlic and cook until it too is soft. Add the stock, beans, tomatoes, tomato paste, sage and thyme, and bring the stwe to the boil. Add the chicken and potatoes to the pan, reduce te heat, and simmer for 30 minutes or until the potatoes are soft. Serve with salad greens. I am a native Queenslander. During most of my formative years, the Premier of Queensland was Sir Joh Bjelke-Petersen, a former Kiwi and a peanut farmer from Kingaroy. Joh was a character in his own right, and I will leave it up to history to decide on whether that was good or bad. Sir Joh's wife, Lady Flo, was famous in her own right, not just for being the Premier's wife or a State senator, but for her pumpkin scones. That's right folks - if you visited the Darling Down in the 70's and 80's, a popular souvenir was a tea towel with Lady Flo's pumpkin scone recipe printed on it. In the Internet age, you no longer need to buy a tea towel to get Lady Flo's pumpkin scone recipe - you can get it online here. This brings me to this week's Tuesday with Dorie challenge, hosted by Prudy of Prudence Pennywise, which is Sweet Potato Biscuits. When I first saw this recipe name, I was imagining sweet potato cookies, because in Australia, as in the UK and New Zealand, a biscuit is the word for a cookie. However, on reading the recipe, I soon realised that this recipe was for biscuits in the North American sense of the term - a savoury scone. These biscuits were delicious!!! I am a pumpkin scone fan, and these biscuits were just like a sweet potato version of a scone. They also looked like sunshine with their deep orange colour. The biscuits were terrific served warm and slathered with butter (or in my case, reduced fat margarine, because my jeans are telling me very unhappy things about my expanding backside). I would happily make this recipe again and again, and it made a pleasant change from the very sweet and rich treats that have frequented our agenda. If you would like the recipe for these sweet potato biscuits, please visit Prudy's site, or buy the book. To see what the other TWD members thought of these biscuits, see the TWD blogroll. I love a cooking class; no matter how basic it is, I always learn something I didn't know before. On Saturday, I attended a chocolate course conducted by Kylie Simpson (head chef at Baguette Restaurant) at Black Pearl Epicure in The Valley. This class was designed primarily as a fun exercise for people with an interest in the topic, so I didn't learn as much as I would have at a William Angliss course, which is taught from an industry perspective. However, I did learn how to make chocolate cups (never had a clue how they made those before!) and got to use gold leaf for the first time. First up, we made chocolate cups by piping melted chocolate into paper or foil cups. I worked out that my favourite cups for this purpose are the foil ones, because they don't distort as easily (which gives you a wonky shaped cup), and because you can easily see where you have piped the chocolate. (I used brown paper cups, which both distorted through my not so careful handling, and in which it was difficult to see where I had piped and where I hadn't). Pretty effective, yeah? I think these would make great Christmas presents that are easy to make. Mine were ginger and orange, cranberry and pistachio, and pear and hazelnut. This was a fun, stress free class, and I found Kylie to be a good teacher. I am doing another Black Pearl class next month, which I also hope will be good. My how time flies when you're having fun. I cannot believe that it has been 12 months since the last World Bread Day. However, today is indeed World Bread Day 2009, and is once again hosted by Zorra of Kochtopf. To participate, all you have to do is to bake or buy bread of any kind and blog about it - simple! Until I started blogging, I would never have dreamed of baking bread, but I am so glad that it is an art I have discovered - the variety and flavour of bread that you make yourself surpasses any supermarket bread, and you would be amazed at how easy it is. The biggest trick is making yeasted bread on cold days, when the yeast needs a little help to get going. This year, I have made an unyeasted Carrot & Walnut Bread. The recipe comes from page 46 of the November 2009 edition of Australian Good Food magazine. Now, the bread in the photo is rustic to the extreme, and I found it a little off-putting. However, I am so glad that I ignored the photo and forged ahead - this bread is moist and delicious, with a wonderful crunchy texture from the walnuts. It actually reminded me more of a cake than a bread because it was so sweet and moist. I did have one hitch with this bread in that the 30 minute baking time in the recipe was clearly not long enough in my case. I thought that my bread was ready at that stage, but the next day when I was cutting it into slices for work, I discovered to my horror that the middle section of the bread was still uncooked in the centre. Dang - all that lovely bread went into the bin. However, the end parts which were cooked through and which I did get to eat were fantastic. I would definitely make this bread again. Preheat your oven to 230 degrees Celsius, and line a baking tray with a silicone baking mat or baking paper. Sift the flours, baking soda and salt together into a bowl, then add the carrots and walnuts. Mix well. Turn the dough out onto a floured bench and knead into a large round or oval shape. Place the dough onto the prepared baking tray and make shallow diagonal slashes across the top of the dough with a sharp knife or box cutter. Remove the bread from the oven and allow to cool on a wire rack before serving slices smeared with butter. Do check Zorra's site for the World Bread Day 2009 roundup here. Good morning!! We had muffins with Dorie yesterday (and weren't they delicious! ); today we are having more muffins - banana date muffins to be precise. This recipe comes from the Perth Diet Clinic, and is perfect for diabetics, but also for people like me who want to try and stop spare tyre spread before it goes further. You can find the recipe here. These muffins are a cinch to make, and are a great way to use up those aging bananas languishing in your fruit bowl. They also taste scrummy. I love dates, even just the cheap cooking dates, so I am in for any recipe that incorporates them. I wouldn't say that these muffins are as wonderful as Dorie's buttery allspice crumb muffins with their crispy streusel topping, but they are pretty damn fine, and a more diet-friendly alternative if you are watching your weight or have special dietary needs. This makes them a winner in my books. Mmmmm ... who couldn't love a spicy muffin topped with a crispy, buttery streusel? And so it was for this week's Tuesday with Dorie challenge hosted by Kayte of Grandma's Kitchen Table, who selected Dorie's Allspice Crumb Muffins. I included blueberries in my muffin batter because I had a punnet of blueberries that needed a home, and these muffins seemed the natural place for them. Overall, these muffins were soft and moist with just the right amount of spice, and the biscuity streusel topping was good enough to eat on its own (which is what I did with the pieces that fell off the muffins on unmoulding). Honestly, you can't go wrong with this muffin recipe, which is one of the best I have ever tasted. To see what the other TWD bakers thought of these muffins, visit the Tuesdays with Dorie blogroll. If you'd like the recipe, buy Dorie's book, or visit Kayte's site. Don't you just love high tea? The very words evoke images of fancy hotels, with powdered ladies decked out like perfumed confections sitting around trays of delicate cucumber sandwiches, tea cakes and biscuits and an ornate pot of piping hot tea. 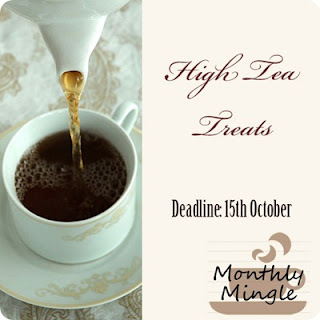 Aparna of My Diverse Kitchen is hosting this month's Monthly Mingle - High Tea. The Monthly Mingle was created by Meeta of What's For Lunch Honey. I have brought along lavender madeleines for high tea, made from Dorie Greenspan's Baking - From My Home to Yours. The recipe is a "playing around" version of Dorie's Earl Grey Madeleines. The lavender flavour is very delicate, in fact so delicate that it is barely there, and comes from lavender-infused butter. My tip is to realise upfront that the batter has to rest for at least 3 hours before baking, so you need to ensure that you have plenty of time up your sleeve. Apparently the resting time helps the madeleines to take on their characteristic humped shape during baking. Melt the butter, then stir in the lavender and allow it to infuse for 15 minutes before straining the butter and discarding the lavender. In the bowl of a stand mixer, rub the lemon zest into the sugar until you have a fragrant mixture. Beat the sugar, eggs and lemon zest together until pale and thick. Add the honey and vanilla to the bowl and beat for another minute. Fold the dry ingredients into the batter, then fold in the butter. Press a piece of cling film against the surface of the batter and refrigerate it for at least 3 hours and up to 2 days. When you are ready to bake the madeleines, preheat your oven to 200 degrees Celsius. Grease a 12 hole madeleine mould and dust with plain flour. Spoon the batter into the moulds, then bake in the pre-heated oven for 12-14 minutes or until golden brown. Remove the baked madeleines from the oven and release onto a wire rack to cool. Dust with icing sugar before serving. Although I don't do it often, I love making bread. I find it very therapeutic to incorporate all of that flour into a dough, then knead it until it is silky and elastic. It's amazing how even the raggediest ball of dough can come together into something quite wonderful. It's been a while since I made bread, and in the interim, I acquired Peter Reinhart's The Bread Baking Apprentice. I did toy with joining the BBA Challenge, but then remembered how I sometimes find it a stretch to keep up with the two groups I am already in and decided to forge my own path as an occasional bread baker. The first bread that I have chosen to make from The Bread Bakers Apprentice is the Cranberry Walnut Celebration Loaf. However, in my case, it should more accurately be called the Cranberry Apricot Raisin Almond Celebration Loaf. Also, I am not sure if "loaf" is the right word for the amoeba-shaped object at the top of this post. Methinks my braiding skills need some work; it would also help if I didn't decide that I absolutely had to go shopping for a dress that I had spied the day before at precisely the time when the dough's rising period was officially over. Despite the odd shape, this bread was rather delicious. I battled to include all of the fruit and nuts recommended, but somehow managed to incorporate them, and for lovers of fruit bread, this loaf is a treat. If you are keen to try this bread yourself, you can buy Peter's book (a little pricey but worth it!! ), or the recipe for this particular loaf can be found online here. This produced a dense, fruity, nutty loaf that was good spread with butter, and would have been perfect toasted. I didn't like it just plain, but then again, I am not a bread eater, so if you love bread, you may have liked this plain. Stay tuned for my next bread baking adventure! It was my friend Ruth's birthday yesterday; however, as she was on leave for the occasion, we had cake in her honour at work today. As you can see from the photo at the top of this post, this cake lives up to its name - it is indeed big! There are three layers of carrot cake smothered in cream cheese frosting (some of which is still living in my fridge at home). You can get the recipe from Slow Like Honey, who hosted the TWD challenge, or from Dorie's book. I decorated the top of the cake with Wilton ready made pink icing, walnut pieces and (although you cannot see it) edible glitter in girly pink, which all the girls just loved! This cake was a hit at work - although you can tell that to my waist line! The Hummingbird Bakery is a famous bakery in London that brings American-style treats to the Brits. They have produced a cookbook, named simply The Hummingbird Bakery Cookbook, which is endorsed by none other than Gwyneth Paltrow. Unfortunately, celebrity endorsements of bakeries do not convince me to buy their products, and I have never been to the Hummingbird Bakery. However, this book was on sale at an online bookstore and looked attractive with recipes that I might actually make, so I bought it. The book does contain some very pretty and dainty baked goods, which is the kind of thing that appeals to my quintessentially girly soul. Accordingly, when looking for inspiration on what to bake recently, I picked up this book and flicked through for something that caught my eye and for which I had the ingredients on hand, it being 7pm on a school night. I settled on the Hummingbird Bakery's Lemon Poppy Seed Cake. I have never made this type of cake before, but a former flatmate of mine used to adore it, so that seemed recommendation enough for me. It is a rather sturdy cake, containing lots of flour which makes for a very thick batter. The resulting cake was, for my tastes, a little on the dry side, but it was simply delightful where the lemon syrup that you pour on top of the freshly baked cake had soaked in. Ruth, my colleague, was also partial to the parts covered by lemon glaze, as she is rather partial to icing. If I made this cake again, I think that I would pour half of the syrup on the base, as directed, and when unmoulding the cake, I'd pour the rest of the syrup on top of the cake, so that the lovely moistness permeates more of the dense cake, transforming it into a citrusy, spongy delight. Preheat your oven to 170 degrees Celsius. Butter a 25cm bundt pan and dust with flour. Sift the flour, baking powder and salt togethe rin a separate bowl. With your mixer on low speed, incorporate the flour mixture into the batter in 3 equal portions. In a separate bowl, beat the egg whites to the stiff peak stage, then fold them into the cake batter. Pour the batter into the prepared bundt pan, and bake in the preheated oven for 40 minutes or until cooke dthrough. While the cake is in the oven, make the lemon syrup by placing the lemon juice, water and sugar together in a saucepan and bringing it to the boil. Reduce the heat and continue to boil until it has reduced by half. Immediately after removing the baked cake from the oven, pour the syrup all over it, then leave the cake to cool in the tin for around 10 minutes before turning it out onto a wire rack to cool completely. To make the glaze, mix the icing sugar and lemon jucie together until smooth, then pour the glaze over the top of the cooled cake and sprinkle it with poppy seeds. This week's Tuesday with Dorie challenge is hosted by Garrett of Flavour of Vanilla, who has selected Dorie's split level pudding. It is a two layer pudding, with dark chocolate ganache on the bottom and vanilla pudding on the top. I made my puddings in martini glasses for visual impact, although Dorie suggests ramekins. It is also a momentous TWD for me, because it is exactly 12 months (that's right, 52 weeks) since I joined the group. My first TWD was the Caramel Peanut-Topped Brownie Cake chosen by my good blogging friend Tammy, and I am amazed at the many different recipes I have tried since then. This week's pudding certainly tasted delicious, but it didn't quite work as it should have for me. I divided the recipe into thirds and deliberately skimped a little on the cream in the ganache, so that when it was chilled, it was hard to spoon out. The vanilla pudding layer was the opposite - it was drinkable. I wish that I had read the TWD forum comments before making this, because a number of other bakers noted that their pudding was fine right up until it was re-processed after thickening on the stove, then it became thin and never recovered. I believe that there is truth in this theory, because the pudding remnants that were left in the saucepan set up fine at room temperature, yet after 8 hours in the fridge, the pudding that had been re-processed as directed after thickening did not set. Oh well, the flavour was great, as I said, so I happily slurped the pudding before getting out a crowbar to eat the ganache ;). You can see what the other TWD members thought of this pudding by visiting the TWD blogroll, and the recipe will be on Garrett's site. On Thursday, we held a baby shower at work for Belinda and Smreen, who are about to give birth to their first children. Everyone brought along something to eat as part of the celebrations. There were pink and blue iced cupcakes, dips, cheesecake, lemon slice and pies and sausage rolls. My contribution was a batch of lavendar and orange flavoured biscuits in the shape of prams and baby bottles. They were a pleasant surpise taste-wise to me and my colleagues. I have to admit I am not a fan of sugar cookies because I find them quite bland, but these cookies were delicious. They were quite soft, and had a lovely shortbread-like flavour with just the faintest hint of lavendar. I was sceptical about the lemon icing, but it worked well, with good coverage of the biscuits. The recipe that I used for these biscuits was from The Australian Womens Weekly Cookies book. You could make these biscuits in any shape that takes your fancy. My only tip is to make sure that you refrigerate the dough for the required time and then work with it quickly, as it softens fast and becomes almost impossible to cut shapes from after that. Put the butter, orange zest, sugar and the egg yolk into the bowl of a stand mixer and beat until light and fluffy. Remove the bowl from the mixer and add the flours, almond meal and lavendar, and combine with a wooden spoon. Turn the dough out onto a floured work surface and knead until smooth. Flatten the dough with the palm of your hand, and place between two large pieces of baking paper. Roll the dough out with a rolling pin to a thickness of approximately 5mm. Cover the dough, and keeping it flat, chill in the refrigerator for 30 minutes. Preheat your oven to 180 degrees Celsius. Line two baking trays with baking paper or silicone mats. Remove the chilled dough from the fridge and, working quickly, cut out shapes using a biscuit cutter. Place the shapes onto the baking trays, leaving room between the biscuits for spreading. Put the baking trays into the oven, and bake the biscuits for roughly 12 minutes or until golden brown. Remove the biscuits from the oven and allow them to cool on the trays. Put the egg white and half the icing sugar into a bowl and stir until combined. Next, stir through the remaining icing sugar until you have a thick but firm icing. Divide the mixture into as many colour icings as you want to make, and tint the icing the desired shade. Spread the icing over the entirety of each biscuit with a knofe or small metal spatula. Beat the egg white with a hand mixer until it is foamy (which I neglected to do!! ), then beat in the icing sugar in small increments until you have a stiff but pipeable icing. (Mine was too thin, hence the blurring of some of my piping - just add more icing sugar to get the necessary consistency.) Spoon the icing into a piping bag and pipe the desired decorations onto the iced biscuits after the first layer of icing has set. On a different note, I have been awarded the Over The Top award by SilverMoon Dragon of Dragon Musings. Thank you so much! The rules of this award are to answer the questions below with one word answers, and pass the award on to 6 of your favourite blogs. 5. Your favorite food? Chocolate! Grease a 19cm x 29cm baking tray, and line with baking paper so that there is a 5cm overhang all the way around. Put all of the ingredients other than the butter into a small saucepan, and stir over a low heat until the sugar has melted. Bring the mixture to the boil, and boil uncovered for 15 minutes or until the mixture is golden brown in colour (150 degrees Celsius on a candy thermometer). Remove the pan from the heat and allow the bubbles to subside before stirring through the butter until smooth. Pour the mixture into the prepared tray, allow it to stand for 10 minutes, then mark it into squares using a sharp knife in slashes reaching right to the bottom of the pan. (If the mixture runs back in to fill up the slashes, allow the mixture to stand a little longer and try again). Allow the butterscotch to set completely at room temperature, then break it into squares along the pre-marked slashes. Wrap sweets individually in small squares of greaseproof paper. I thought that these looked pretty neat!!! And if you were one of my Pay It Forward winners, one of these will be winging its way to you.